Ankit Fadia is one of those rare 27-year-olds who needs little introduction. As a self-proclaimed ‘ethical hacker’, an eloquent speaker, television star and author of more than a dozen books, Fadia has reached dizzying heights. While thousands of ill-informed members of the public flock to his seminars to listen to their articulate ‘hacking guru’, both computer security experts and reclusive hackers hiding behind nicknames regularly scoff at his abilities. The latest missile fired into Ankit Fadia’s territory has come in the form of a comprehensive Forbes article by Charles Assisi, who blows the lid off the man’s journey to fame. The article is in fact an open letter to Fadia, based on conversations with the man himself. Charles Assisi is currently the Executive Editor at Forbes India. An award winning technology journalist, he has also worked as the National Business Editor at the Times of India, and the Editor of CHIP, a computer magazine. 2 How do you tell if Fadia has lied? 3 How do you gain recognition? Claim to have worked for top secret agencies! 4 Isn’t there an element of Ankit Fadia in everyone? I can’t help but summon the hackneyed marketing mantra, “Be the brand, and let the brand be you”. Ankit Fadia has brilliantly built a brand around his name; even Assisi is forced to concede this. I’ve found two factors that stand out in Fadia’s fraudulent journey as described in the Forbes article. The first is about lying blatantly, and the second one is about taking advantage of obscurity that the world has to offer. How do you tell if Fadia has lied? 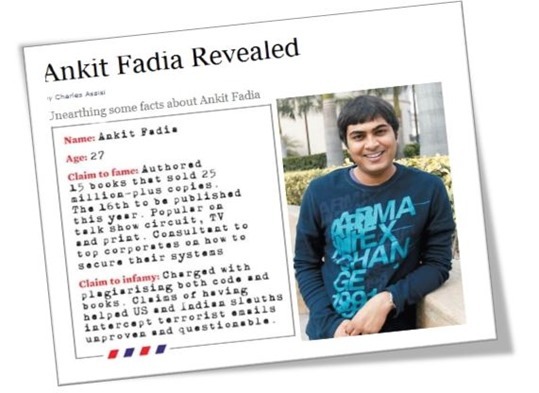 Ankit Fadia claims to have defaced the front page of computer magazine CHIP’s website at the age of 13, something he says impressed the editors of the magazine. In the rise and rise of Fadia, honesty has had little incentive. With his powerful oratorical skills, Fadia has gained a huge fan following among both novices and sub-par journalists. How do you gain recognition? Claim to have worked for top secret agencies! It is a well-known fact that intelligence agencies worldwide zealously guard their secrets in the name of protecting national security. They also go to the extent of unleashing misinformation to sufficiently obscure the facts on the ground. For Fadia, these mysterious ways have proved to be a high tide. Although, this tweet probably came out of sarcasm, this is not the first time “top secret projects” have helped his brand. Early during his meteoric rise, Fadia claimed to have been contacted by US intelligence agencies for help with an encrypted threat message. For whatever reason, the world’s experts on cryptography had to be ignored to make way for a 16 year old “whizkid”. Don’t be surprised if you can’t find an official explanation from government sources. Staff running secret projects understandably may choose not to respond, confirm or deny. But who is the clear victor here? Ankit Fadia! 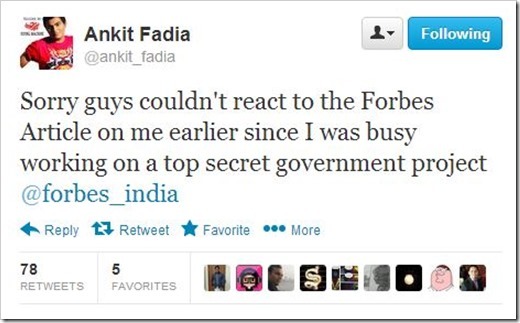 Isn’t there an element of Ankit Fadia in everyone? It may sound rude, but there’s a bit of Ankit Fadia in everyone, and we might be inadvertently helping each other out. For instance, LinkedIn endorsements will tell you how brilliant a programmer has been, and the kind of dent he has made in the universe. How many of them warn you that he flies off the handle easily, and is impossible to work with? If we want to look to eradicate the Fadia element in ourselves, let’s look no further than the example of 46-year-old Russian mathematician Grigori Perelman. Perelman successfully solved the Poincaré conjecture, a mathematical problem that had baffled experts for over a century. In recognition of his work, Perelman was awarded the Fields Medal in 2006. He refused to accept it. Later in March 2010, he was awarded the prestigious $1 million Millennium Prize by the Clay Mathematics Institute. Perelman turned that down as well, in spite of being urged to accept it or give the money away in charity. I met Ankit Fadia in one of his presentation in 2004 @IIT delhi. I asked him one simple question about triggering a man-in-the-middle attack for users behind NAT, he was clueless of how to initiate NAT hacks. So undeserving of the title ‘Hacker’. Interesting way of looking at the other side of the coin & take positives Naweed. Indeed, he is substantially successful in creating a brand out of it. Some people from the Advertising/PR or Marketing would know its worth, I am sure. Jealous of Ankit? Looks that way!